Having previously looked at the growth of Eton Wick it is now time to reflect on some of the happenings that importantly changed the lives of earlier generations. For centuries hamlets and villages like ours were centred around farms and the small clusters of labourers' dwellings; all having well trod cattle and foot tracks. Such as they were, the local tracks or roads would have been seasonally either very muddy or dusty routes between farms and fields, labourer cottages, market or the nearest water source. In Eton Wick we have at least four of those 'in' village roads and three other 'through' tracks that connected the village to the outside towns and villages. The 'in' tracks were (a) Sheepcote Road and (b) that part of Common Road that bisects the Great Common and connects between Manor and Saddock Farms and Sheepcote Road. The third is Bell Lane that connects Bell Farm with the main road of today and the old Kings Highway; and lastly Browns Lane (now known as part of Common Road) that gave access from Dairy Farm to the main road. Over the years some roads have changed their name. The main part of Common Road is probably as old as there have been dwellings along it. Additionally there were many tracks that did not develop, a few of these still survive. The three through roads were Inner Meads Lane between the Common Road farms and Eton's Common Lane; the old Kings Highway between the top of Bell Lane and Brocas Street, Eton, that was joined by a track from Old Boveney, immediately south of the Eton Wick Church; and the road we all use and was later designated the B3026. The first two have declined rather than developed, but should give us a good idea of the roads our forefathers were used to. Tracks still used include the path from the Great Common to Chalvey, paths to the river, also between Bell Farm and Little Common; across the 'sleds' to Meadow Lane, and across Dorney Common to Old Boveney. You will doubtless think of others. Since the 1870's at least another fourteen roads have been created in what we now know as Eton Wick. The Walk, Victoria Road, Alma, Inkerman and Northfield Roads were developed between 1875 and 1900; Tilstone Avenue in the mid 1930's and at least another eight since WWII ended in 1945. Albeit some are estate roads and/or cul de sacs. In its early years Moores Lane was not in Eton Wick and not known by that name until John Moore came to the area in the 1880's. There was a footpath across the fields known then as the 'slipes' and leading to Cippenham. Since the Slough sewage farm and later it's staff houses were developed half way to Cippenham, the road was improved and we know it as Wood Lane. The 20th Century brought many changes to the village with the coming of gas (1910), electricity from 1949, main drainage, subsequent central heating and double glazing, but I think there were more noteworthy advances in the 1800's. At the outset the population was approximately 100. There was no school, church or cemetery, no shops or public meeting place and no piped water. Even the Thames must have seemed untamed with no weirs to control the flow — hence more flooding — and no pound locks to make navigation easily possible. Young children would have worked in the fields with mum; weeding, gathering and gleaning for the backyard hens. They rarely left the village and probably some never did. Some village lads helped with the horse drawn barges, each leading their 'charge' along the towpath to Marlow where they unhitched the horses and stabled overnight with the horse before riding it back across Maidenhead Thicket to Windsor. My Father did this as a schoolboy in the late 1890's and was paid the princely sum of one shilling (5p). In those pre school years of early 1800's many would have been unable to read or write. The first school locally was Eton Porny, built in 1813 and replaced with the present school in 1863. It was another 27 years before Eton Wick's first school (1840) which again was replaced by a school in Sheepcote Road in 1889. Even then the school attendance was not always considered necessary or possible. It was not until 1875 that schooling became compulsory. As late as 1888 an item in the Parish Magazine reported that 90 children could be educated free of charge at Eton Porny, subject to regular and punctual attendance of Sunday School for at least one year and of being parishioners of Eton, born in wedlock. Until 1890 schooling was not necessarily free and a charge of two pence or more each week was the norm! This may not seem much but for labourers working for perhaps one pound, having several children, could amount to 10% or more of the family budget being paid out for an education that parents themselves had never enjoyed. In the years before schools, Sunday Schools had meant just that; the opportunity to learn to read and write as well as being taught the gospel. Apparently Eton Wick did have a circuit preacher for a while in the early 1800's. With no hall or school he would have needed to use a farm barn or a local cottage. Between the 15th Century and 1875 the Eton College Chapel had served as the Parish Church. There was no other church in the town until 1769 when a small chapel was built near the present site of St. John the Evangelist. Being unsatisfactory it was replaced 50 years later, itself to be replaced by the present church in 1854. Eton Wick had to wait and make do with going to Eton or perhaps Dorney until in 1867 St. John the Baptist was built. The Methodist Chapel in Alma Road was built 19 years later, in 1886, and in that year a branch of the Temperance Guild came to Eton Wick. Although the village had a church in 1867 the churchyard was not consecrated for burials until 1892. The Eton cemetery near Cotton Hall was first used in 1847 and for 45 years villagers were obliged to go there for burials. The first Parish Magazine was produced in 1878, just three years after the Parish Church was established at Eton's St. John the Evangelist and much of local history used by writers since then have used the writings of Reverend John Shepherd in those early magazines, and his subsequent book. The first shop of any consequence in the village was that of Thomas Lovell, baker, post office and household goods, recorded in 1878 at the Ada Cottage (immediately west of the 'Three Horseshoes' public house). 'The Shoes' was first recorded in the Victualler's Recognizance's around 1750. The Greyhound' and The Shepherds Hut' were first licensed in the mid 1830's and The Grapes' (later The Pickwick' and now a restaurant) in 1842. Boveney's first pound lock was installed in 1838 and was replaced by the present lock in 1898. Socially the village came of age in the last decades of the 19th century, forming a Horticultural Society with its first show in 1878; (twelve years before Eton Town's first show). A village Football Club around 1880, a Cricket Club in 1889, a Young Men's Club in 1885, a Rifle Club in 1899 and getting its first allotments in 1888 and 1894. Also in 1894 both Eton Wick and Boveney New Town each had its own five man Council, to manage their affairs independent of Eton for the next 40 years. This had not happened before and has not been so since. In 1892 piped water came to Eton Wick. Only recently built houses would have had this luxury, away from the hitherto shared pumps, but it not only provided water indoors but introduced garden cesspits and indoor toilets. Early recipients included those in The Walk and in Victoria Road. The first trains crossed a wood viaduct over The Slads and the Thames in 1849 and this must have heralded affordable coal for the masses. Its earlier transport depended on barges. Yes, I think the 19th Century brought us more real advances. We could say 'light years' ahead, even though the village depended on candles and oil lamps — the gas (1910) and electricity 40 years later had still to arrive. In 1800 there was no Boveney New Town and the village population was around 100. In 1899 there were 450 in Eton Wick and slightly more in Boveney New Town. Now it has roughly trebled the 1899 combined total. 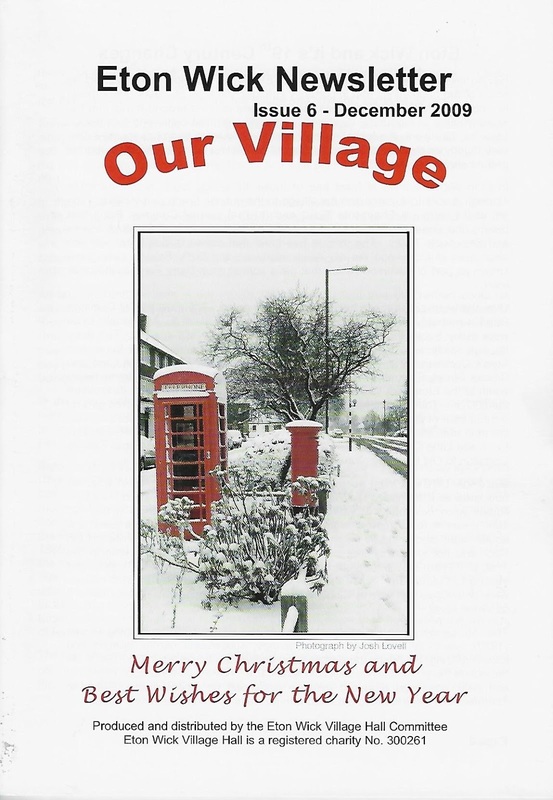 Click here to read Our Village December 2009. Note: since this article was written in 2009 The Pickwick first became The Silk Road and then closed. The Three Horse Shoes and the Shepherds Hut have also closed leaving the village with one pub, The Greyhound open for business. The pubs that were known as the Shoes and the Grapes have been converted into houses as have all the other former commercial properties on the north side of the Eton Wick Road over the past 50 years. The Shepperds Hut's future is as yet unknown.